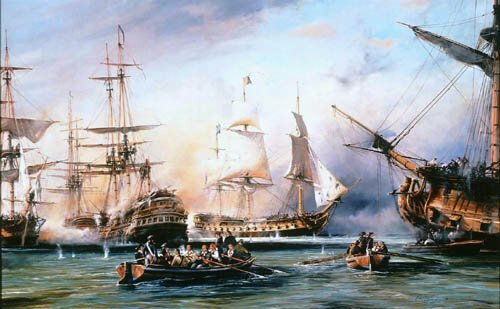 Robert Taylor's dramatic painting depicts the Battle of the Nile at about 1800 hours on August 1, 1798. Having caught Napoleon's French Fleet completely by surprise in Aboukir Bay, Vice-Admiral Nelson engaged at 1700 hours. Many of Napoleon's crew were ashore or visiting other ships, and the painting depicts the frantic efforts of crews to rejoin their own ships, immediately following Nelson's attack. Overall print size: 39" x 28"